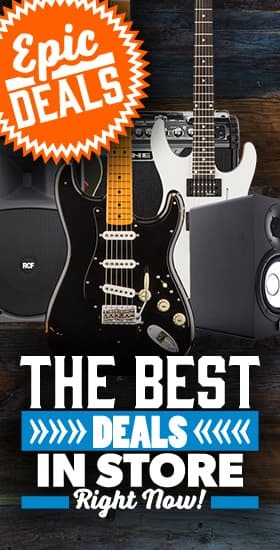 Friedman Amplification - Andertons Music Co.
Friedman Amplification are known known for building some of the most desirable high-end amplifiers available today. Delivering arguably some of the best distortion tones you’ll ever hear, Friedman amps also boast gorgeous cleans with plenty of headroom. Bursting onto the amp scene only a few years ago, Friedman have already established a solid reputation in the industry. Recently introducing an electric guitar range, their instruments boast the same level of quality as their amps - with similar “hot-rodded” styling. Friedman have also dipped their toes into the world of effects pedals, with a line of stompboxes that derive from their amplifier lineup. With a huge number of high-profile names on their roster, such as Jerry Cantrell (Alice in Chains), Bill Kelliher (Mastodon) and Steve Stevens (Billy Idol), you can be assured that their amps mean serious business. The company’s founder, Dave Friedman, had spent years working for some of the biggest names in the music industry. With 25 years of experience building full-fledged tour-ready rigs and modifying amplifiers for some prestigious clientele, Friedman decided to start his very own amplifier company in sunny California. With Dave’s extensive knowledge and his skilled team of employees, Friedman have developed an enviable amplifier range. Using only the best hand-picked components and parts, the attention to detail with Friedman is evident, with Dave inspecting, playing and signing every amp before shipping to retailers. Friedman’s recent range of electric guitars are built by legendary luthier Grover Jackson. With an amazing old-school vibe and convincing relicing, their guitars feel played in and familiar from the first chord. Friedman’s BE-100 is what put the brand on the map. Essentially a hot-rodded Plexi, this amp head can dish out some of the most crushing high-gain tones around. Used by a number of artists, this amp has become a true modern classic. Another staple of their range is the Dirty Shirley, a single channel amplifier with a fat British sound, providing beautiful cleans to pure filth. With a number of their amps available as heads or combos, Friedman also build super-sturdy speaker cabinets. Featuring high-end speakers from Celestion, they effortlessly deliver the iconic Friedman tone. Friedman’s guitar range includes the Vintage T and Cali models. Based off a famous Fender design, the Vintage T has a classic look with modern features such as a compound radius for the great playability. Available with a number of different pickup configurations, this guitar can suit a variety of players or genres. The Cali model brings that iconic 80s Superstrat look into the 21st Century. Sporting dual high output humbuckers and locking Floyd Rose tremolo systems, this model is a performance machine. Friedman’s BE-OD pedal derives from their BE-100’s distortion channel. Unveiled at the 2016 NAMM show, this incredible unit catches the essence of the BE-100 with great conviction. Other stompboxes in their pedal range include the Dirty Shirley Drive and the tube-driven Motor City Overdrive, similarly offering genuine Friedman tones in a tiny enclosure. Their new line of pedalboards are rugged, tour-grade pedal platforms. Featuring built-in buffered patch bays with MIDI integration, they’re aimed at pro’s looking for amazing rig solutions.